PT Tambang Batubara Bukit Asam Tbk – PTBA or referred to as “PT Bukit Asam Tbk” is a leading public-listed coal mining company in Indonesia. Based in Tanjung Enim South Sumatera, PT Bukit Asam Tbk is widely known nationwide as one of the largest coal mining companies in Indonesia with 7.29 billion tons of total resources and 1.99 billion tons of total mine-able reserves. 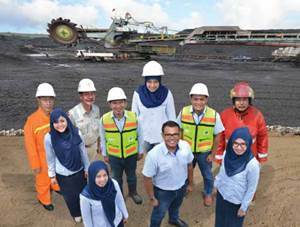 PT Bukit Asam Tbk maintains approximately 90,832 hectares of mining business license (IUP), comprise of Tanjung Enim Coal Mine (66,414 hectares), Ombilim Coal Mine (2,950 hectares), Peranap Mine (18,230 hectares), and IPC mine (3,238 hectares). PT Tambang Batubara Bukit Asam Tbk is a member of state-owned mining holding company PT Indonesia Asahan Alumuninum (Persero) or INALUM Group. At present, PT Bukit Asam Tbk is 65.02% owned by INALUM Group and 34.98% by general public and investors. PT Bukit Asam Tbk now has 11 subsidiariy/affiliated companies; PT Batubara Bukit Kendi, PT Bukit Pembangkit Innovative, PT Bukit Asam Prima, PT Internasional Prima Coal, PT Bukit Asam Banko, PT Bukit Asam Transpacific Railways, PT Huadian Bukit Asam Power, PT Bukit Asam Methana Enim, PT Bukit Asam Metana Ombilin, PT Bukin Asam Metana Peranap and PT Bukit Milti Investama. In term of financial performance, PT Bukit Asam Tbk recorded a satisfying financial result in 2017 According to PT Tambang Batubara Bukit Asam Tbk Annual Report 2017 as cited by JobsCDC.com, PT Bukit Asam Tbk managed to record a total revenue of Rp 19.47 trillion at the end of 2017 or equal to an increase of around 38% compared to Rp14.06 trillion in the previous year. Total operating profit grew 136% to Rp5.90 trillion from Rp2.53 trillion in 2016. Required experience for minimum 7 years. 1 year fixed term contract for all positions.